Need to Manage Your Time? It’s so easy to feel I need to “manage my time” so I can do everything on my plate. Do you have that idea, too? Then last week I went to the Doctor for a routine appointment… And was pronounced sick with a contagious virus and told to stay home for 5-7 days. Ack! I didn’t feel too bad, mostly tired and spaced out. (Usually sick for me means sleeping all day feeling miserable.) Yet the fog made me slow down. There were a few things I could do with my feet up, so I did those while feeling guilty and ineffective. Most of them involved knitting. So I listened to Tara’s podcast 46 from a few months ago… About “Time Management Fallacy.” It was the perfect message. Don’t plan forever, just dive in & do the work. Don’t give yourself 2 hours for a 20-minute job. Stop doing things you don’t need/want to do (and are doing because others want you to). Choose to enjoy time, not cram it full of more tasks. Excuse me, I’m off to work on the porch with my laptop. Seize the day!!! I clipped this quote somewhere on the internet, and now I’ve done a Google search and a search of Facebook and can’t find it. May the writer forgive me for sharing these wise comments (which clearly were intended to be shared) without attribution. ” When I was studying nursing, I worked in a nursing home. There were so many residents that had sentimental and special things that were given away, in pristine condition and never used. It just seems like such a waste! For the record, I’m showing Ms. Brett’s photo here… and then showing the photo that has been accompanying the post on Facebook. I happened to recognize the incorrect photo. It’s Iris Apfel, a New York fashion icon and designer. I love her style!!! Click here for more photos and information on Iris. I’m in a group on Facebook full of entrepreneurs working solo. One week there was a challenge to find things in our homes that we had not used, that we were essentially “saving for good.” I did well in the kitchen area, there was one jar of golden syrup that I deem so yummy I was saving it for a special occasion. I’d used my long-saved saffron and a vanilla bean, before the challenge. But in my closet? Oh, the beautiful clothing I wasn’t wearing. I have a 1960’s Hawaiian dress, in like-new condition. I sort of think of it as a museum piece and so I leave it for later, which never comes. I have a hand-woven/hand-embroidered dress from 1970’s Egypt which I’ve never worn and now doesn’t fit me anymore. I do have some textiles I deem collectible which I never intended to wear (hand-embroidered with hand-dyed threads, from Uzbekistan and Turkey… and hand-knitted Turkish socks and Andean hats). I also have an amazing wool double-knit top from the 70’s (back when polyester double-knit was king… with op art patterns). But really? Why not wear a dress until it doesn’t fit my 50-something body… when it did fit when I got it as a gift from a woman who bought it in Egypt? And I have some amazing yarn I’ve collected as souvenirs on my travels. The problem with this is that I typically buy yarns I can’t get at my local shop. And I make a living helping shops help their customers, by pairing their yarns with my designs. So it’s hard to justify knitting with a specialty one-off yarn. Isn’t life funny? I think I don’t hoard. I don’t hoard food or household supplies. I don’t hoard money, goodness knows. But I hoard textiles, which are my most precious things. I am now eager for a hot day. It’s time to wear that dress. Despite the impossibility of that statement being true for a knitter, I think she felt that color combining was something born inside us or not. She presented the subject as innate, not learnable. She was interested in my Crystal Sock from Knitty.com. She joined in a conversation with others who are doing a knitalong with this design. I encouraged her with a shorter version of this post, and it helped her. Maybe it could help you, as well. Luckily for us, color combining is something that can indeed be learned. I’ve been practicing it since I was a child… this was my focus from a very early age. However, you can join me in the fun! Start easy and work outward. Colors have three different attributes. We learn two of them as we grow up (light green/ dark blue), but the third is not discussed much. That one often is the problem when something seems not quite right with a grouping of colors/yarns. Me? Saturated most of the time, the brighter the better. My purples may go dark… yellow-green or silver may be light, but usually I stay to medium values. Turquoise? I love it from warm/light aqua to dark teal. Gray or no gray, dark or light… this color seems to make me look good no matter what “flavor” it is. My personal preference is for cool colors that are totally intense, no gray or brown added… mediums, not too dark or light. That’s MY thing. I look best in this sort of color. If you look best in soft color or warm tones, you’ll have a different take. Since nearly everything in my closet is magenta/hot pink, purple, turquoise, hot yellow-green… all my colors look great together though I never buy “outfits.” I’ve got intense blue-toned colors and they all work. I have so much of turquoise/blue-green in my closet and jewelry box that sometimes I end up wearing many versions of it all at once. I’ve found that once you get to the 3rd version of a color all together, they no longer look like they “don’t match.” They then morph into what artists call a “monochromatic” (one color) color scheme. At left, you see me in one version of turquoise monochrome. We all know someone who wears all beige (a warm neutral, as opposed to gray which is a cool neutral). Top to toe, neutral. They look pulled together, right? This simple method of combining “colors” is a monochromatic color scheme. It’s simple, and effective. You can do this with your own best color. Look great in loden green? Indigo blue? Charcoal? Red? Purple? Go for it. Likely your most-chosen color makes you look and feel great. If you can free yourself from worrying about “matching” exactly, you can combine 3 or more versions of that color on the same day (and look Marvelous, Darling). If you are doing knitting colorwork, however… be cautious. You will want to go dark/ medium/ light versions of the same color to pull off enough contrast. The above neckwarmer shows a light icy robin’s-egg blue with a darkish teal. Both colors are in my favorite blue-green range but with enough value contrast to really show off the stripes. These colors would work for finer patterning in stranded (“fairisle”) colorwork as well. An easy way to start combining colors if you’re new to the idea, is to group colors touching one another on the color wheel. Try a Sedona desert look with red/orange/salmon, or spring pond with purple/blue/turquoise/green (as seen on right). Grouping things like this is called “analogous” color. Humans tend to like this sort of assortment (think batiks in indigo plus purple and green). Next is an analogous combination of periwinkle (medium-light, muted blue-purple) and a lighter, also-muted blue-green. In this case, the contrast worked for stripes but might not work for more subtle colorwork. I took a few classes from Nanette Roche, author of The New Clay. This was the first book available on Polymer clay, and it still stands tall as an overall reference rather than a how-to-make-a-project book. Nanette talked a lot about contrast in class. She was the first person I knew who talked about warm/cool as a type of contrast. Before her, I thought of it only as dark/light. Since then, I’ve found that I can play with colors which are closer together in value (both medium) if one is warm and one is cool. For example, medium blue contrasts very well with medium red. This gave me a lot more flexibility, many more options. I continue to be grateful for this lesson. Here are two examples of warm/cool contrast in knitting colorwork. Note that on the right hat, the “warm” is actually a yellow-green which might look cool next to a different set of colors. That hat benefits from value difference (a light versus a medium-to-dark multicolored yarn). What if it Looks Wrong? Of course, theory won’t do it all for you. I tend to go to the yarn shop or into my stash, grab a bunch of yarns I think might work together, and plunk them all down on a table. Then I add and remove yarns from the pile until I get what I think will work. See? These are all a little grayed, and I used them all blended in the one project shown below. I feel it worked well. 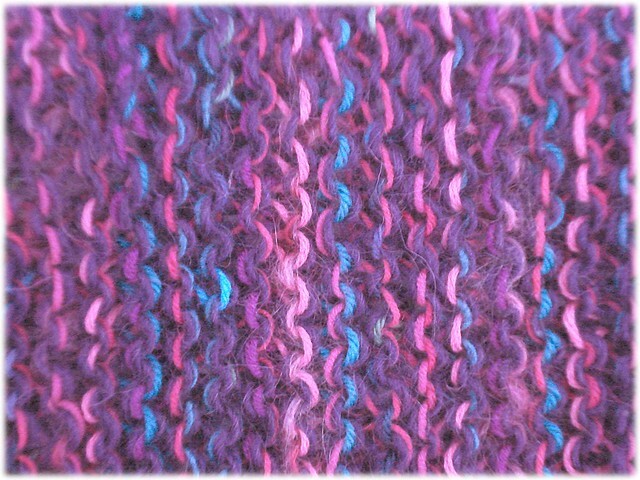 Usually if I have a grouping of yarns and one looks way off, it’s an intensity/saturation problem. All saturated except for one soft/muted color? The muted one will look dirty or gray.Â All subtle and muted except for one crayon-like color? Even if they are all the same value, the non-muted color will feel wrong and possibly garish. I also look to see if my colors are warm versus cool. If I’m choosing six colors and one of them is warm but the rest are not (or vice-versa), that one may look wrong. Generally, it’s a saturation issue about 90% of the time when something goes wrong. We tend to think blue goes with blue or pink goes with pink, but not always! I taught this lesson in person a few years back at a library branch. One knitter who attended also is a quilter. She recently thanked me, and said she’s not having problems choosing fabrics as she did before my class. I’m thrilled. Remember, colors look different depending on which other colors they are near. It really requires a look, not just a theory, to find what works well. Did this information help you? I sure hope so. I’d love a conversation about this. If you have any questions, input, further ponderings… I’d love to hear from you in the comments. You can post as a guest if you don’t want to sign up for a Disqus username/password. Toothpaste is a good, nontoxic silver polish. I love sterling silver jewelry, and when I want to wear some earrings I’ve ignored for a while, toothpaste is right there and easy to use. Just wet the silver item, and put a little toothpaste on a finger or a cotton rag. Rub gently, rinse and dry. Easy! Perhaps finer silver needs a finer grit than this, but it’s great for everyday jewelry. Go to it and shine!!! Image added May 1: handcrafted earrings I purchased in Addis Ababa, Ethiopia, in early 2005. First one unpolished, second one shiny from a quick rub with toothpaste. I keep realizing I know cool hints that other folks might like to know, too. This seems frivolous, but I keep coming back to the idea. Hints/tips don’t need photos most of the time. Maybe this will help me post more regularly for you. Let me know how you like the idea, OK? If you need to cut brownies or other sticky baked goods before they have a chance to cool off, use a plastic knife. Brian theorizes that the plastic does not heat through as quickly as metal, and one must admit that plastic knives are more slippery than most metal knives. It helps to let them cool a little bit, but you do not need to wait as long as usual. This tip has made my life more pleasant on brownie-baking days. Today my 6-year-old friend (Fairy Goddaughter) Isabel and I made brownies together. I used this tip to get our treats sooner than normal. You can imagine that the child was delighted. Thanks to friend Cynthia for sharing this one. She learned it from someone at a potluck once and shared it with me. This is the best sort of folk art, don’t you think?